The Totem Pendant is not just for mid-century interiors. How about a Totem Linear Pendant in a San Francisco Victorian's dining room? Shown with a Coal fixture and 22k yellow gold leafing on the inside, the Totem Linear Pendant is casual yet dressy. Carved moulding and beautiful hardwood floors are paired with modern art and a simple table. Have a longer table? Lengthen the canopy and add more stems (3 or 5 stems standard). Tall ceiling? Increase the HOA by adding more cast forms to each stem (3, 5 and 7 standard). Did we mention the fixture is versatile? Select a single-stem pendant, or a multi-stem version with either a linear canopy (shown above) or a round canopy. Choose your desired number of stems (3 or 5) and your desired number of cast forms on each stem (3, 5 or 7). You can also specify the cast form shapes you want - all ovals, all trapezoids, or a mix of both. Are you confused? Download the tear sheets. If you must layer on the mid-century modern, we won't fault you. 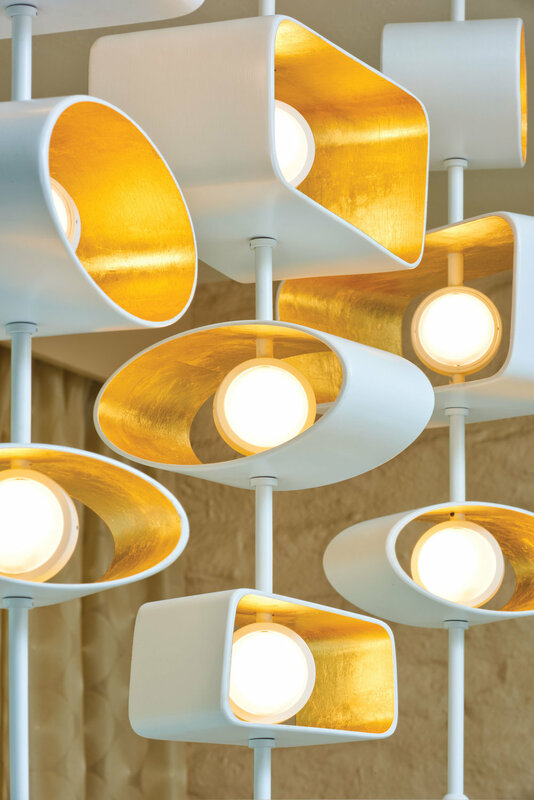 In fact, we love what Boyd Lighting CEO, Jay Sweet, did in his Palm Springs, CA condo. The Totem Linear Pendant in Cloud fits right in.